The satisfying, nutty flavor of high quality sesame oil is the hallmark of authentic Asian cuisine. From stir-fries to salad dressings, toasted sesame oil stirs the imagination and adds a Far Eastern note to everyday fare. What's more, sesame oil is one of the world's purest and healthiest cooking oils. The overpowering taste of many commercial brands of toasted sesame oil destroys the delicate balance of flavor required to do many authentic Asian dishes. Only the careful, slow processing used by traditional sesame producers maintains and preserves the subtle flavor of roasted sesame seeds. This superb, 100% pure, unrefined oil made by carefully pressing the highest quality Japanese white sesame seeds. The natural, low temperature process enables the seeds to retain their delicious, mild nutty flavor and an abundance of natural antioxidants that make this oil exceptionally stable. Valued for its healthy balance of fatty acids, unrefined, raw sesame oil is the supreme cooking oil. The ideal choice for daily use, Mitoku Virgin Sesame Oil is easily digestible and is excellent for saut�ing, braising, and deep-frying (great for tempura), as well as in dips, dressings, and baked goods. Its mild flavor will enhance and never overpower the natural flavors of any dish. Besides its versatility in cooking, Macrobiotic and Ayurvedic teachers espouse the benefits of rubbing pure sesame oil into the skin. Also may be used for eye-treatments. Satin-smooth with the subtle taste and aroma of freshly toasted special quality "golden" sesame seeds. The labor intensive process used at the Hiraide shop in Aizu, Japan avoids the harsh chemicals used by modern processors, and preserves the nutrition and taste of premium sesame seeds. The sesame seeds are slowly roasted over wood fire, crushed with rollers to crack the skins, then steamed for a few minutes to make the oil flow more freely. The steamed sesame meal is placed in a wooden tub. With gentle pressure, the seeds easily release their rich aromatic oil, which is then filtered through handmade Japanese paper. 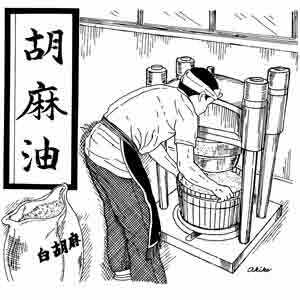 This is ichiban shibori, first pressing, a pure, golden sesame oil of extraordinary lightness and exceptional flavor. With its mouth-watering aroma and rich, nutty flavor, Mitoku Toasted Sesame Oil is prized as a seasoning agent as well as a cooking oil. It gives a distinctive character to many Asian favorites. Mitoku Toasted Sesame Oil is made from whole sesame seeds that are carefully toasted, then gently pressed to expel their fragrant oil. Red chili pepper is blended with toasted sesame oil to impart the fiery flavor of Mitoku Hot & Spicy Oil and is a traditional seasoning that adds rich sesame flavor and stimulating, red-hot goodness to all your meals. Just a few drops of Hot & Spicy Oil will add a new dimension to stir-fried vegetables or noodles, Japanese noodle broth, hot & sour soup, and other ethnic entrees.